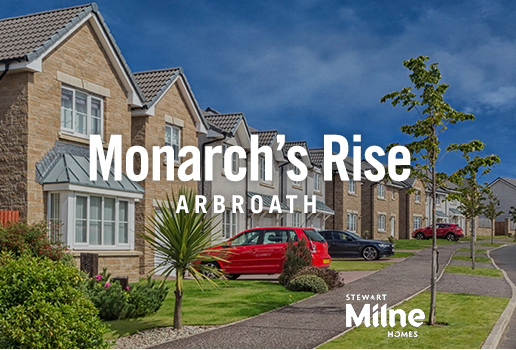 Located in the bustling seaside town of Arbroath, Monarch’s Rise features a collection of three, four and five bedroom homes. As well as picturesque surroundings and a lively local community, buyers will benefit from more competitive house prices without comprising on the quality with each home built to Stewart Milne Homes exacting standards that has seen it awarded five star building status from the Home Builders Federation. The quality build of each home is matched by equally impressive interiors which include generous ceiling heights and spacious rooms that can be personalised with a choice of kitchens, vanity units and Porcelanosa tiling all offered as standard and chosen by the buyer. At the heart of each home is the kitchen with integrated SMEG appliances and spacious areas for dining. Each of the homes feature French doors leading onto a private garden while others also include a separate utility room providing additional storage space and a place to take care of everyday essentials. A separate living room and dining room provides space for more formal entertaining. Careful planning is given to the upstairs of each home with clever layouts and ample storage space included. In addition to a master en-suite, many of the larger homes feature a guest en-suite shower room as well as built-in wardrobes. The exterior of the home has not been overlooked and every property includes a paved driveway and garden with freshly laid turf. Monarch’s Rise has been designed with a range of buyers in mind; from those looking for their first home to growing families looking for additional space and with homes from £168,995, Help to Buy is available. As well as benefiting from more competitive house prices than neighbouring Dundee, buyers can also take advantage of part exchange as well as a 5% deposit match or part exchange and 12 months of mortgage payments included (not applicable to the Heddon or Glenmore plots), meaning owning your dream home can be a reality in 2018. It may be a historic spot but Arbroath also has a good selection of shops and cafes to choose from as well as host of outdoor pursuits allowing new residents the chance to explore the local surroundings. The area is also well-served for families with a selection of primary schools, nurseries as well as secondary education at Arbroath Academy. The three bedroom Argyll is priced from £168,995 while the five bedroom Heddon is available at a reduced price: was £279,000 now £249,000. Buyers looking for a home ready to move into are in luck, as the four bedroom Glenmore showhome is now available from £244,995, reduced from £259,995 and includes carpeting, lighting and furnishings. There is limited availability on these plots, and reservations must be made by 28th February 2018.